The geography of early Ireland and Irish territories. Resources for Kerry, stretching from history and culture to maps and places. Introducing The Kane Ancestral Map of Ireland, an Irish family map of Ireland that provides the history, roots, and genealogy of over 760 Irish families. Provides the lineage of over 750 ancient Gaelic families who are descendants of the Royal Milesian line. With a special focus on ancient and medieval Irish tribes and septs. Poor Law Union maps of Co. Kilkenny. General resource for Irish history. Ordnance Survey Ireland is the national mapping agency of the Republic of Ireland. Our primary product is mapping services. We produce a very comprehensive range of urban, rural, tourist and leisure maps at a variety of scales. These maps are produced in digital form as well as on paper. The base data used to create the map series is also used to produce other products such as aerial photography and digital terrain models. Land & Property Services(LPS) is responsible for mapping Northern Ireland. The Geographic Information (GI) that we collect is used in a number of different ways. The accuracy and quality of these antique maps was not surpassed for centuries. These editions are individually treated and presented on an antiqued parchment entirely in keeping with their historic nature. Each map is beautifully engraved and crammed with quite extraordinary detail. Fascinating and absorbing. Rare antique maps and atlases from the 15th to 19th centuries, as well as a fine selection of views and reproduction antique maps. Townland maps by civil parish. The following maps are from "The Cambridge Modern History Atlas" edited by Sir Adolphus William Ward, G.W. Prothero, Sir Stanley Mordaunt Leathes, and E.A. Benians. Cambridge University Press; London. 1912. Users can access the index to locate place names within the atlas. County Kilkenny is located in southern Leinster Province of the Republic of Ireland. Interactive Ordnance Survery maps of the entire country of Ireland. From 1086 to 1114 the most powerful king in Ireland was Muirchertach O'Brien. He had dealings with the Anglo-Normans and the Norwegian king, and dominated most of the country. Ireland was divided up into counties by the English crown around 400 years ago. Since then, the counties have remained largely unchanged. Maps for the Mayo parishes of Kilgeever, Ballyhean, Ballintober, Islanddeady, and Aughagower. Hundreds of historical maps pertaining to the counties of Leitrim and Roscommon. An image of the mapped Creggs Parish: Creggs Parish is in the Ballymoe Barony, and is disected by the Civil Parish's of Dunamon (yellow), Ballynakill (light blue), Kilbegnet (green). Maps are absolutely essential to understanding the history of families in Co. Longford. 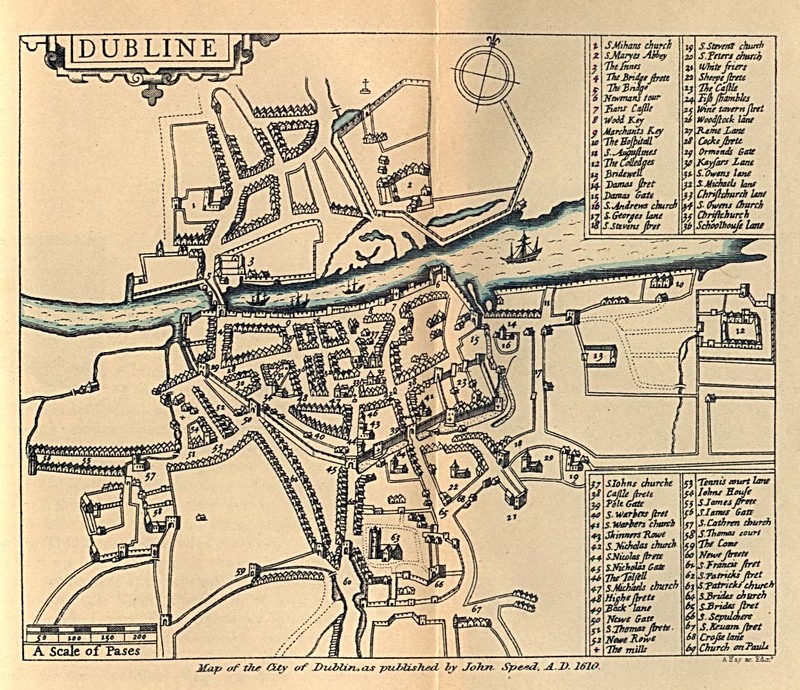 Map of Dublin City in 1610. Links to maps online of County Antrim. The 1835's first edition of the Ordnance Survey's 6-inch maps - in parts until 1848 revised - is now available. Barony map of East Cork. Brian Mitchell's book "a New Genealogical Atlas of Ireland" was a guide for the map. Map resource for County Mayo.